"Proletarians of all nations, unite!" Anthem: "Молдова ку доинэ стрэбунэ пэ плаюрь"
The Romanian language was officially called Moldavian in the Moldavian SSR until 1989. The Constitution did not define any official language; see Radio Free Europe report for details. Moldavian Soviet Socialist Republic (shortly: Moldavian SSR, abbr. : MSSR; Romanian: Republica Sovietică Socialistă Moldovenească, in Cyrillic alphabet: Република Советикэ Сочиалистэ Молдовеняскэ; Russian: Молда́вская Сове́тская Социалисти́ческая Респу́блика Moldavskaya Sovetskaya Sotsialisticheskaya Respublika), also known to as Soviet Moldavia or Soviet Moldova, was one of the fifteen republics of the Soviet Union which existed from 1940 to 1991. The republic was formed on 2 August 1940 from parts of Bessarabia, a region annexed from Romania on 28 June of that year, and parts of the Moldavian Autonomous Soviet Socialist Republic, an autonomous republic within the Ukrainian SSR. After the Declaration of Sovereignty on 23 June 1990 and until 23 May 1991 it was officially known as the Soviet Socialist Republic of Moldova. 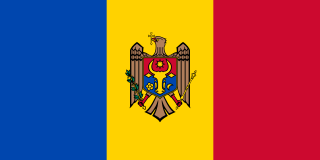 From 23 May 1991 until the declaration of independence on 27 August 1991, it was renamed the Republic of Moldova whilst remaining a constituent republic of the USSR. 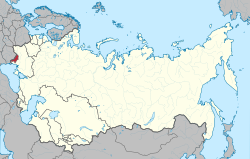 Its independence was recognized on December 26 of that year when the USSR dissolved. 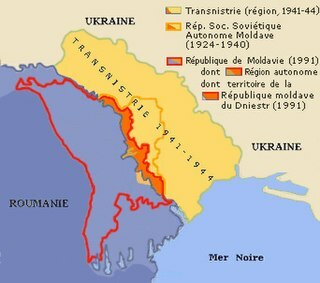 Geographically, the Moldavian SSR was bordered by Romania to the west and Ukraine to the north, east, and south. After the failure of the Tatarbunar Uprising, the Soviets set up an autonomous Moldavian Autonomous Soviet Socialist Republic (Moldavian ASSR) on October 12, 1924 within the Ukrainian SSR on part of the territory between the Dniester and Bug rivers, as a way to prop up the propaganda effort and help a potential Communist revolution in Romania. German map of the new MSSR, sept. 1940. The old Moldavian ASSR was dismantled and the Moldavian SSR was organized on August 2, 1940 from six full counties and small parts of three other counties of Bessarabia, and the six westernmost rayons of the Moldavian ASSR (about 40% of its territory). 90% of the territory of MSSR was northeast of the river Dniester, which was the border between the USSR and Romania prior to 1940, and 10% southwest. Smaller northern and southern parts of the territories occupied by the Soviet Union in June 1940 (the current Chernivtsi Oblast and Budjak), which were more heterogeneous ethnically, were transferred to the Ukrainian SSR, although their population also included 337,000 Moldovans. As such, the strategically important Black Sea coast and Danube frontage were given to the Ukrainian SSR, considered more reliable than the Moldavian SSR, which could have been claimed by Romania. A de-kulakisation campaign was directed towards the rich Moldavian peasant families, which were deported to Kazakhstan and Siberia as well. For instance, in just two days, July 6 and July 7, 1949, over 11,342 Moldavian families were deported by the order of the Minister of State Security, Iosif Mordovets under a plan named "Operation South". Collectivisation was implemented between 1949 and 1950, although earlier attempts were made since 1946. During this time, a large-scale famine occurred: some sources give a minimum of 115,000 peasants who died of famine and related diseases between December 1946 and August 1947. According to Charles King, there is ample evidence that it was provoked by Soviet requisitioning of large amounts of agricultural products and directed towards the largest ethnic group living in the countryside, the Moldovans. Contributing factors were the recent war, the drought of 1946, and collectivisation. With the regime of Nikita Khrushchev replacing that of Joseph Stalin, the survivors of Gulag camps and of the deportees were gradually allowed to return to the Moldavian SSR. The political thaw ended the unchecked power of the NKVD/MGB, and the command economy gave rise to development in the areas such as education, technology and science, health care, and industry (except in the fields that were considered politically sensitive, such as genetics or history). Between 1969 and 1971, a clandestine National Patriotic Front was established by several young intellectuals in Chișinău, totaling over 100 members led by Mihail Munteanu, vowing to fight for the establishment of a Moldavian Democratic Republic, its secession from the Soviet Union and union with Romania. In December 1971, following an informative note from Ion Stănescu, the President of the Council of State Security of the Romanian Socialist Republic, to Yuri Andropov, the chief of KGB, three of the leaders of the National Patriotic Front, Alexandru Usatiuc-Bulgăr, Gheorghe Ghimpu and Valeriu Graur, as well as a fourth person, Alexandru Șoltoianu, the leader of a similar clandestine movement in northern Bukovina, were arrested and later sentenced to long prison terms. Victory Day celebrations in the Moldovan SSR on May 9, 1980. In the 1970s and 1980s Moldavia received substantial investment from the budget of the USSR to develop industrial, scientific facilities, as well as housing. In 1971, the Council of Ministers of the USSR adopted a decision "About the measures for further development of Kishinev (Chișinău) city" that secured more than one billion rubles of investment from the USSR budget. Subsequent decisions directed enormous wealth and brought highly qualified specialists from all over the USSR to develop the Soviet republic. Such an allocation of USSR assets was partially influenced by the fact that Leonid Brezhnev, the effective ruler of the USSR from 1964 to 1982, was the Communist Party First Secretary in the Moldavian SSR in 1950-1952. These allocations stopped in 1991 with the dissolution of the Soviet Union, when the nation became independent. Although Brezhnev and other CPM first secretaries were largely successful in suppressing Moldavian nationalism, Mikhail Gorbachev's administration facilitated the revival of the movement in the region. His policies of glasnost and perestroika created conditions in which national feelings could be openly expressed and in which the Soviet republics could consider reforms independently from the central government. The Moldavian SSR's drive towards independence from the USSR was marked by civil strife as conservative activists in the east (especially in Tiraspol), as well as Communist party activists in Chișinău worked to keep the Moldavian SSR within the Soviet Union. The main success of the national movement in 1988-1989 was the adoption on August 31, 1989 by the Supreme Soviet of Moldova of the Moldavian language as official, declaration in the preamble of a Moldavian-Romanian linguistic unity, and the return of the language to the pre-Soviet Latin alphabet. In 1990, when it became clear that Moldavia was eventually going to secede, a group of pro-Soviet activists in Gagauzia and Transnistria proclaimed independence in order to remain within the USSR. The Gagauz Republic was eventually peacefully incorporated into Moldavia as an autonomous territory, but relations with Transnistria soured. Its sovereignty was declared on June 23, 1990 on its territory. Flag of the Moldova SSR/Republic of Moldova from 1990-1991. 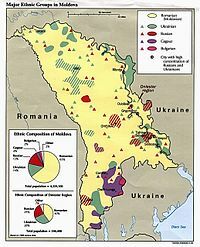 On March 17, 1991, Moldova, alongside with the Baltic states, Armenia and Georgia boycotted the union-wide preservation vote with 98.72% in favor without any official sanction. On May 23, 1991, the Moldavian parliament changed the name of the republic to the Republic of Moldova. Gagauzia declared independence as a republic on August 19, 1991. Moldova then seceded from the Soviet Union and became an independent sovereign state on August 27, 1991, after the failed coup in Moscow. After that period, on August 22, 1991 at 12:15 pm Kishinev time, the statue of Vladimir Lenin was toppled by protesters in the Moldavian capital. Independence was quickly followed by civil war in the east of the country (Transnistria), where the central government in Chișinău battled with separatists, who were supported by pro-Soviet forces and later by different forces from Russia. The conflict left the breakaway regime (Pridnestrovian Moldavian Republic) in control of Transnistria - a situation that persists today. The Soviet Union ceased to exist on December 26, 1991 and Moldova was officially recognized as an independent state. On 1–2 August 1976, Nicolae Ceaușescu, Elena Ceaușescu, Nicu Ceaușescu, Ștefan Andrei, Ambassador Gheorghe Badrus were the first high-level Romanian visitors to Moldova since World War II. On 1 August, they came from Iași and the First Secretary Ivan Bodiul, Kiril Iliashenko [ro], N. Merenișcev escorted them from the border, and on leaving for the Crimea at the Chișinău International Airport on 2 August. The move was widely interpreted as a sign of improved relations. During a meeting, Brezhnev insisted that Ceaușescu himself had the opportunity to see that the Moldavians existed as a separate people with a separate language during his 1976 visit. "Yes," Ceaușescu replied, "I did, but they spoke with me in Romanian." After the fall of communism in Romania, on April 5, 1991, its president Ion Iliescu, and Soviet President Mikhail Gorbachev signed a political treaty which among other things recognized the Soviet-Romanian border. However, the Parliament of Romania refused to ratify it. Romania and Russia eventually signed and ratified a treaty in 2003, after the independence of Moldova and Ukraine. The Moldavian Communist Party was a component of the Communist Party of the Soviet Union. The Communist Party was the sole legal political organization until perestroika. It had supreme power in the land, as all state and public organizations were its subordinates. The little nationalism which existed in the Moldavian elite manifested itself in poems and articles in literary journals, before their authors were purged in campaigns against "anti-Soviet feelings" and "local nationalism" organized by Bodiul and Grossu. The official stance of the Soviet government was that Moldavian culture was distinct from Romanian culture, but they had a more coherent policy than the previous one from the Moldavian ASSR. There were no more attempts in creating a Moldavian language that is different from Romanian, the literary Romanian written with the Cyrillic alphabet being accepted as the linguistic standard for Moldavia. The only difference was in some technical terms borrowed from Russian. Moldavians were encouraged to adopt the Russian language, which was required for any leadership job (Russian was intended to be the language of interethnic communication in the Soviet Union). In the early years, political and academic positions were given to members of non-Moldavian ethnic groups (only 14% of the Moldavian SSR's political leaders were ethnic Moldavians in 1946), although this gradually changed as time went on. ^ Dumitru Lazur, Omorâţi mișelește de bolșevici comuniști, Curierul Ortodox, nr 6 (191), 15 June 2007. ^ "Forme de rezistenţă a populaţiei civile faţă de autorităţile sovietice în RSS Moldovenească (1940-1956) Petru Negura Elena Postica". Dystopia. I (1–2): 59–88. 2012. Retrieved 2013-10-09. ^ Igor Casu, Igor Sarov, eds. "Республика Молдова от Перестройки к Независимости, 1989-1991. Сборник документов" Check |url= value (help) (PDF). Retrieved 2014-10-19. ^ Foreign Relations of the United States, Memorandum of Conversation, Tuesday, June 22, 1976, 3:35-4:05 pm, The White House. Edineț is a town and municipality in the north of Moldova. It is the administrative center of the eponymous district. The town is located 201 km north of the national capital, Chișinău. It is located at 48°10′N 27°19′E. The town administers also two suburban villages, Alexăndreni and Gordineştii Noi. The population at the 2004 census was 17,292, including 15,624 in the town itself. Ivan Ivanovich Bodiul was a Soviet and Moldovan politician prominent in the Moldavian SSR, particularly during the Brezhnev era. An election for a Supreme Soviet took place in Moldavia in 1940. The poll was an effort to legitimize the Soviet occupation of Bessarabia and Northern Bukovina which had taken place immediately prior. Since 1918 these regions had been part of Romania. All deputies returned were members of the Communist Party of Moldavia, a branch of the Communist Party of the Soviet Union. The Supreme Soviet subsequently adopted the 1941 Constitution of the Moldavian Soviet Socialist Republic, under which the MSSR was a constituent of the Soviet Union. Soviet control was interrupted by the Axis occupation from 1941 to 1944. The issue of Bessarabia in Romania–Soviet Union relations was originally avoided in the 1950s, but as Romania began to distance itself from the Soviet Union, the issue of Bessarabia was brought up in Romanian public discourse whenever relations between the two countries soured.